The first time I was called Mrs. Pokrywka was right after Stan and I went through the saber arch at our wedding. 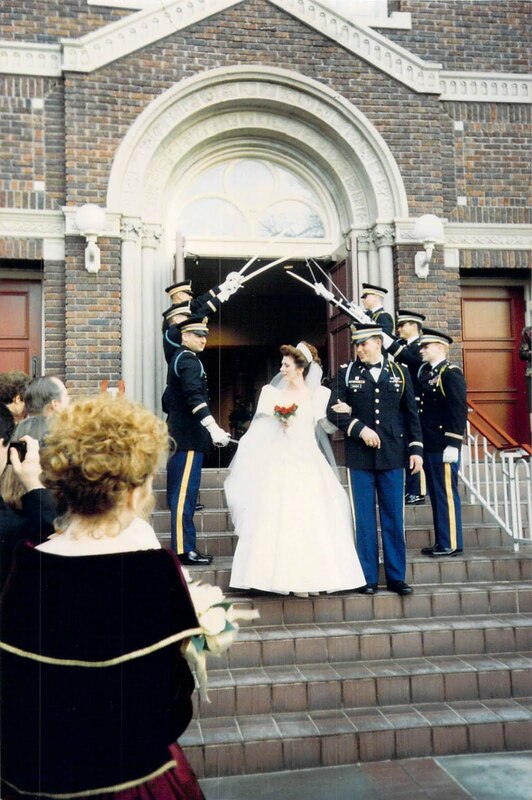 As we exited the arch I was “smacked” in the rear with a saber by Stan’s company commander as he said “Welcome to the Army, Mrs. Pokrywka.” It took me a few seconds to realize he was talking to me. In all of the months of planning the wedding, I never stopped to consider that I would become a Mrs. Pokrywka. I didn’t practice signing Mrs. Stanley Pokrywka or Jennifer Pokrywka or even Jennifer Combs-Pokrywka. I never really thought about the name change thing. To me, I was (and still am) Jenni Combs, not Jennifer Pokrywka and certainly not Mrs. Pokrywka. The name never stuck with me. From the very beginning I never wanted to be Mrs. Pokrywka. I hyphenated my name so I could be my own version of a Pokrywka. I know Jenni Combs-Pokrywka is a mouthful so most days I am just Jenni. I like being just Jenni. I am comfortable with my name. My kids’ friends’ parents are not so keen on their kids calling me Jenni. I understand their desire to have their kids learn to respectfully address adults but Mrs. Pokrywka is not me. As a compromise, some of the kids’ friends get around things by calling me Mrs. Pokey (Zach’s nickname). Most call me Ms. Jenni. A few of the older, braver souls just call me Jenni. It makes me smile when I hear the kids call me Jenni. It’s like they are trying their wings at being an adult ~ if I am the one they can practice on, then I’m glad to help. Previous The Countdown is Officially ON!